Raise your hands if you love tacos! Today’s recipe of shrimp tacos with chipotle sour cream sauce is one that I have been wanting to share for a while. Tacos are so much fun because you get to eat them with your hands and it is almost impossible to have a bad taco. Most foodies will tell you that the sauce is what makes the taco which I agree with. For this recipe, I made a chipotle sour cream sauce with Dean’s® DairyPure low-fat sour cream, a little ranch dressing, chives and some chipotle peppers. For these reasons this sour cream is good for you and I love that it comes in both regular and low-fat option. I used the low fat option but if you want a creamier sauce definitely go with the regular sour cream. The only thing I regret is that I did not make more. After dinner I noticed my fiancé Marcus was heading over to the kitchen for seconds only to return with a puzzled look on his face because he thought there would be more. I saved the night by boiling some sweetcorn on the cob but next time I will remember to double the servings. Dean’s DairyPure Sour Cream can be found at most major grocery stores, I got mine at Shaw’s. Remember to look for the tub container in the sour cream section. I am hooking you up with a coupon to use for your next purchase! Click this Dean’s DairyPure sour cream coupon link to save on your next purchase. FYI: This is a sponsored post in partnership with Dean’s DairyPure Sour Cream. As always, the writing and opinions in this post are my are own. Cook shrimp for about 4 minutes on each side and set aside. In a large bowl mix cucumber, tomatoes, onion, sweetcorn, onion powder, cumin, chives, olive oil, salt and pepper. Warm tortillas in a pan or microwave then fill with shrimp, mixed veggies, avocado and top with the sour cream sauce. 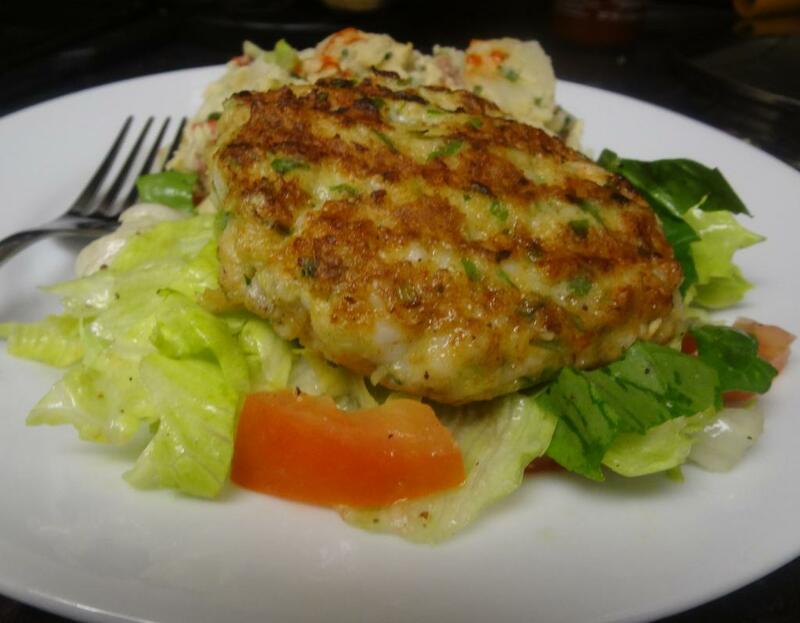 If you are a big fan of seafood and are tired of the same old turkey or chicken burgers, I have just the thing for you ” shrimp burgers” They are absolutely tasty and most importantly they are a healthy alternative to beef burgers.This recipe was inspired by one of my favorite chef’s Rachel Ray. Chop garlic and onion in a food processor and place in a large bowl. 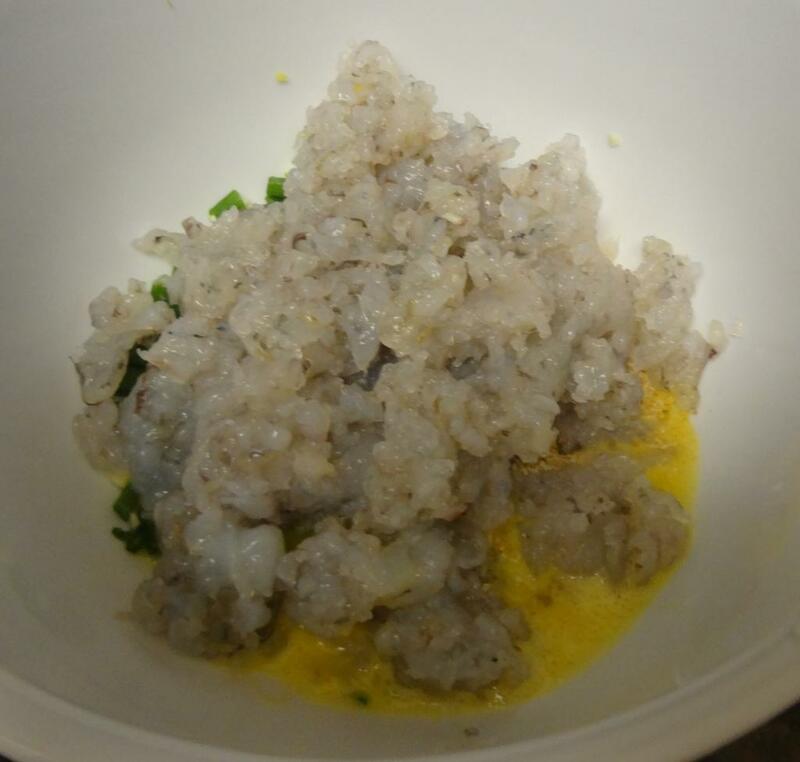 Next, roughly chop the raw shrimp in the food processor making sure you still have some chunks to give texture. 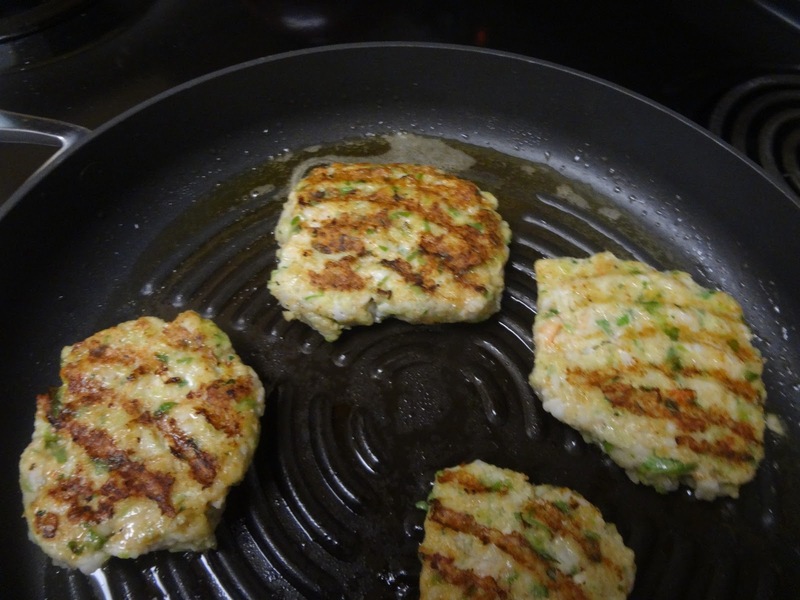 Heat olive oil in a griddle pan and cook patties for about 3 minutes each side until golden brown. Nobody wants to spend hours in the kitchen on a weeknight so quick and easy recipes are a must. Last year I fell in love with Israeli couscous because of its versatility and easiness to cook. Israeli couscous is a toasted pasta shaped like little balls and is a great substitute for pasta or rice. I am always experimenting with couscous and today I will share with you a Israeli couscous recipe that I put together . Let me know what you think. 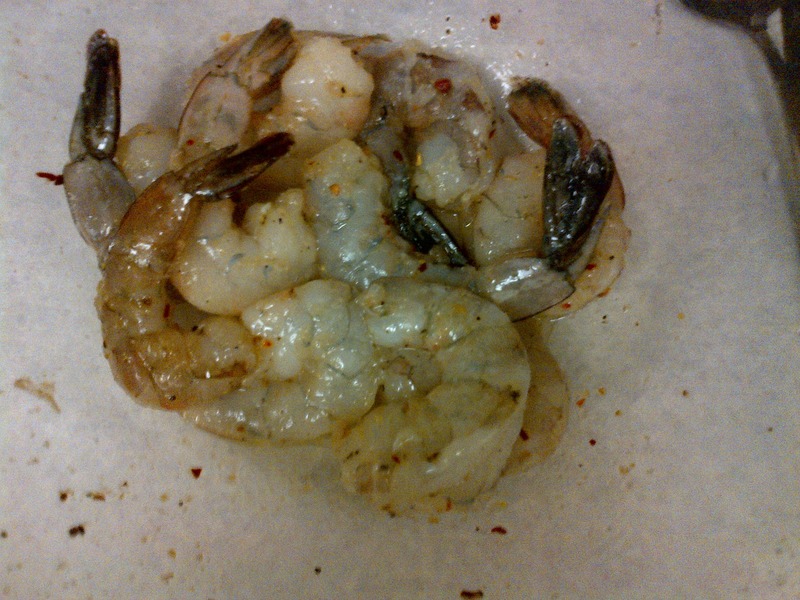 10 jumbo shrimp seasoned with chili garlic paste , 1/4 tsp garlic powder and black pepper. heat 1 tbsp olive oil in small pot then add couscous. cook couscous until it starts to brown. Squeeze juice from half a lemon into couscous until it evaporates. Add chicken broth , lower heat and cover pot. Couscous will cook for about 10 minutes. Couscous is ready when liquid is fully absorbed .Cover pot with lid and start preparing vegetables. Heat 2 tbsp olive oil in large wok or pan then add onions and mushrooms. Add curry powder or curry mix then add garlic and ginger. Cook for about 2 minutes. Add carrots, kale, peppers and cook for another 5 minutes . Add seasoned shrimp and cook for 3 – 5 minutes or until shrimp is pink and opaque. ﻿After shrimp is cooked add cooked couscous and mix. ﻿﻿Dinner is served after 30 minutes. Another weeknight success! Seafood is one of those things that you either love or hate , I am definitely on team seafood. Some health professionals recommend eating 2 portions of seafood each week e.g salmon and shrimp because they are a good source of protein and minerals. 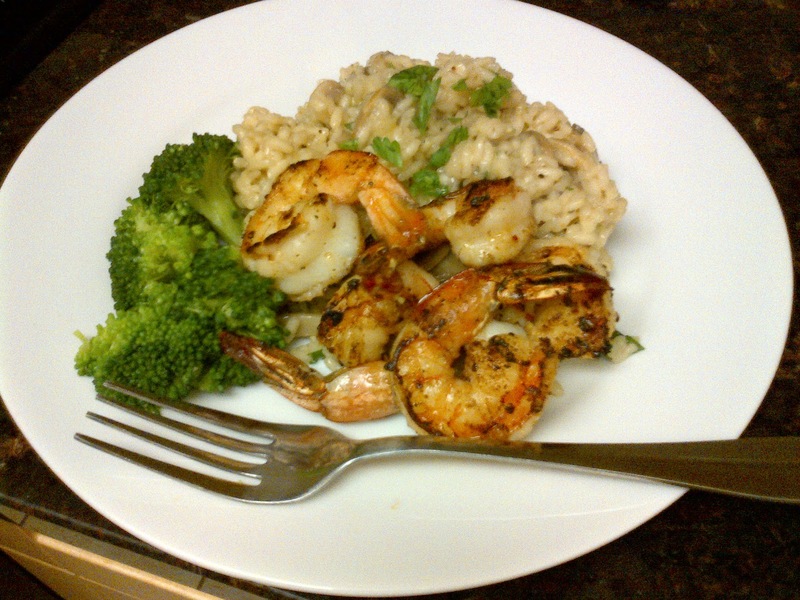 As we all know white meat is better that red meat health wise, so if you are not a big fan of seafood you can start with shrimp as it is easy to cook. My darling boyfriend is a seafood lover and there is one dish that he loves ‘Garlic Shrimp’ He has asked me to make it so many times that I could make it with my eyes closed. 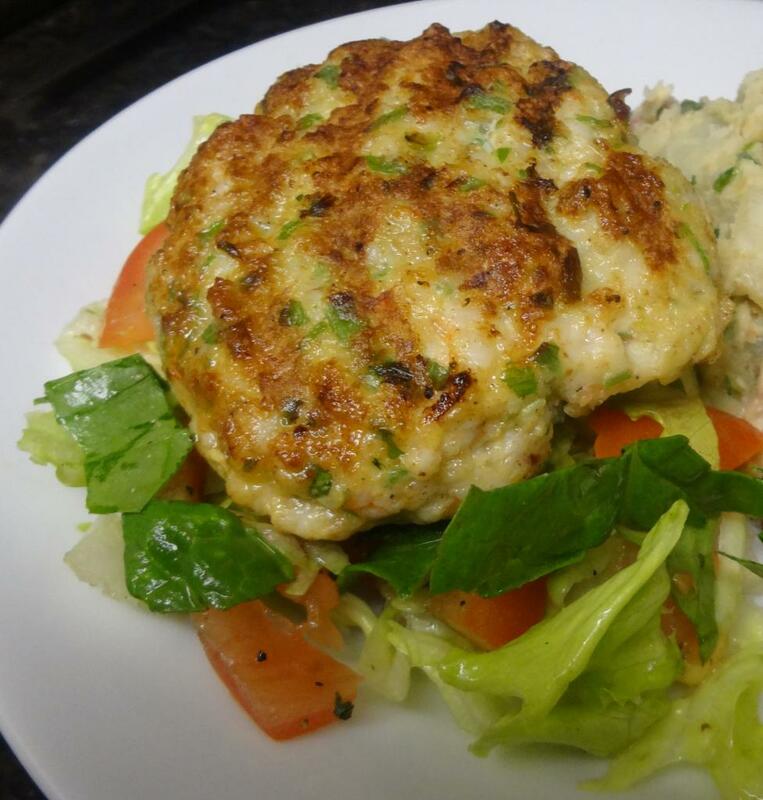 I decided to share this easy recipe with you and I can assure you it is very tasty too! Mix lemon juice, garlic, red pepper flakes , 1 tbsp olive oil, shrimp ,salt and pepper in a medium size bowl. Meanwhile heat the rest of the olive oil in a griddle pan. Place shrimp in pan , make sure they are not too close together to prevent them from steaming. Once shrimp is cooked on both sides serve immediately . I served mine with mushroom risotto and steamed broccoli. Yummy!